Conversational commerce: Are chatbots and AI the future of digital shopping? The Takeaway: Brands and retailers are using Facebook Messenger and chatbots to sell products. Is this real or just fantasy? Messenger apps and services such as Kik, WhatsApp and Facebook Messenger have taken off in popularity, and brands and retailers are starting to find ways to connect with consumers in a personalized way through these platforms. New strides in artificial intelligence and machine learning are part of what makes this possible. Together, these technologies form chatbots - or messenger service-based AIs. These machines want to sell your brands' products and services. Yup, they're for real, and nope, they aren't like Tay.ai, so don't worry. "Chatbots want to sell your brands' products and services." The New York Times recently reported on Facebook's venture into the chatbot space. Zuckerberg's social media giant has plans to open up Messenger and its chatbot technology to brands and retailers. This new AI system will be able able to read messages, see images and offer consumers curated product collections accordingly, while also taking into account the personality and shopping history of its users. "We're conversational creatures," said David A. Marcus, vice president of messaging at Facebook. "That's the way our brain functions. That's the way we're wired. As a result, it's probably the most natural interface there is." And Facebook isn't alone in its gamble on conversational commerce. It's quite the opposite, actually. The NYT explained that 1-800-Flowers, Spring, Poncho, CNN and more already have strategies that incorporate Facebook's chatbot tech, while Sephora and The Weather Channel are using the Kik messaging services. Then there's Microsoft with it's Twitter chatbot, and Google's bot, which will gladly debate the finer points of the true meaning of life. Right now, it's hard to say if the chatbot trend will take off. Microsoft's foray ended badly, which is unfortunate from an AI/machine learning-perspective. Meanwhile, brands and retailers exploring conversational commerce and chatbot technologies have no idea how their customers will respond. Will they react in horror, anticipating a Skynet takeover and fearing for their privacy? Or will consumers gladly accept all the personalized help they can get? We're leaning toward the latter. The interest in chatbots is indicative of the larger picture: Consumers will engage if they get a curated experience that gives the them the information they need to make a purchase decision. Furthermore, they want to be able to easily discover that product information. After all, we've covered the rise of conversational commerce before, and it fits into the bigger puzzle of distributed commerce. Consumers want what they want when they want it, and if they don't get it, they'll walk away. That's especially important when it comes to product content and detailed information. 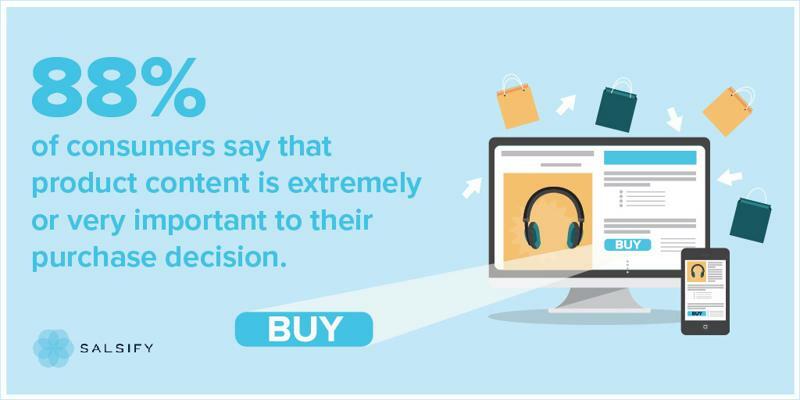 Our recent consumer research report, "Cracking the Consumer Code," outlined exactly this point: Eighty-eight percent of shoppers said that product content plays an extremely or very important when making purchase decisions, and if 94 percent of consumers can't find that information, they'll go to another site or quit shopping for that item altogether. Check out our new consumer research "Cracking the Consumer Code" for more unique insights into the modern shopper's behaviors. Chatbots and other conversational commerce tools, like social media, give brands and retailers the opportunity to make product and product content discovery much easier. These messenger services have the ability to simplify the path to purchase and provide shoppers with an incredibly seamless experience - these AIs will remember customers' personalities and purchase history, and they can converse with consumers on every digital channel. Shoppers could even consult chatbots while in stores. That's distributed commerce to a T.
Whether or not chatbots become the next big thing, it's clear that brands and retailers need to improve the consistency and accuracy of product content today, or they won't have the right content - or the ability - to drive tomorrow's shopping conversations. You're going to want the technology and processes to support that future as soon as possible. This isn't science fiction, folks. AI and chatbots are a thing now, and it's time to start thinking about how they may fit into your consumer-focused strategy. Especially if you're leading the ecommerce charge at today's brands and retailers.